I have little faith and lesser expectations when something is marketed as revolutionizing a genre, particularly if its from an app developer that’s not that well-known. Plus, it’s also classified as an RPG. Usually, unless the game itself needs to be paid for, it doesn’t even begin to satisfy as an RPG. 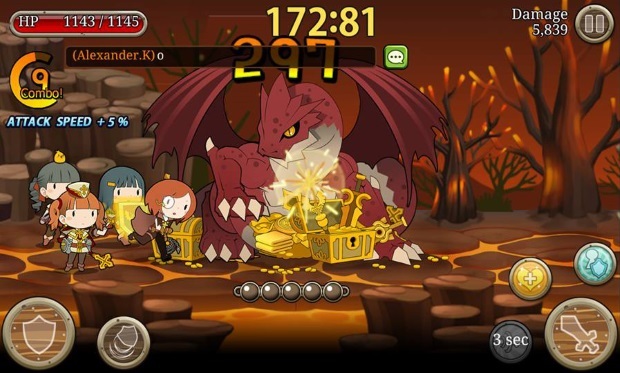 Free-to-play “RPGs” tend to only feature various usable units for play with varying stats to give the impression of a field and variation, but have little to offer in terms of varying tactics and strategy in usage. Truth be told, I even thought I would automatically just lambast the title. But on reviewing another game by Com2Us and seeing how great Summoners War: Sky Arena was, I decided to give Knights N Squires a shot. 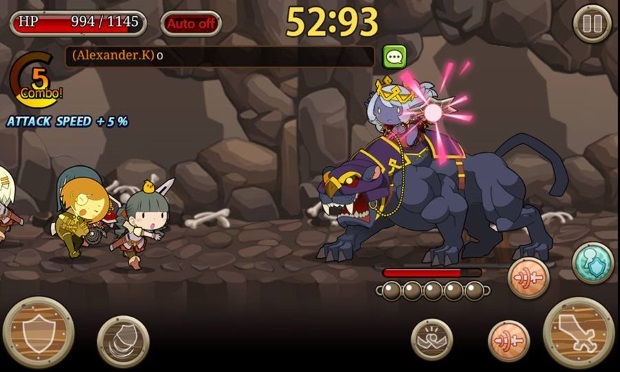 Knights N Squires is an action RPG that combines various aspects of monster collection, endless running, and maybe a little bit of a rock-paper-scissors system. The premise is that your kingdom has been under attack, and your princess has been kidnapped – and it’s up to you, the lead knight, to gather troops to storm countless waves of enemies, rescue the princess, and ultimately save the day. The basic gameplay is that your character runs continuously down a stage, not being able to stop, and you have to hack and slash your way through until the end of each level where you have to kill a boss.There are three main commands available to you. One is your basic attack which lets you whack whatever is directly in front of you. Another is your basic guarding, which is mainly your only form of defense since you’re recklessly and brazenly just storming through everything. Lastly your third command is throwing your shield, which allows you to attack airborne enemies ahead Captain America-style, but leaves you unable to guard until the shield zips back to you. There is no jumping, evading, crouching, or stopping. Getting hit by enemy attacks may act like speed bumps, but otherwise your character just runs ahead hacking his way through the fog. Sounds like a typical mindless brawler, but this game requires some serious focus and strategy. When you have ten enemies bearing down on you and you need to throw your shield because someone decided to be a high-flying hipster instead of just being a ground mob like everyone else, things become a lot more complicated. Blocking, throwing, and using special abilities become quite a tactical affair. Also, as you continually hit and your combo increases, you get bonuses like an increase in attack speed that further enhances your genocidal capabilities. But wait, there’s more. The RPG aspect of things comes into perspective when you start having some allies tag along. 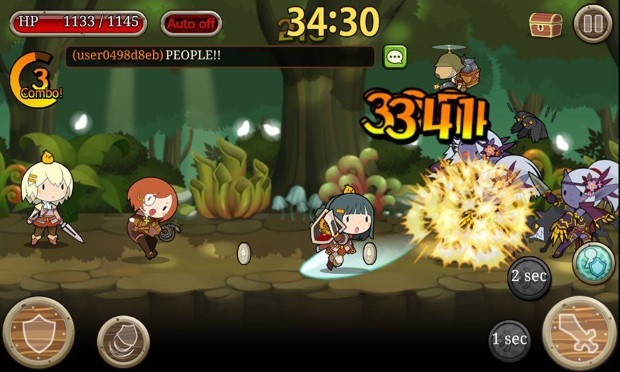 You can bring a maximum of three units with you and each available unit has his or her own unique set of stats and abilities. They all have auto-attack, but you can select when to activate their special skills, which range from projectiles to powerful dash attacks to healing and rejuvenation. And as it is a running game, each stage has a set timer and you have to kill everything in your path and reach the end of the level before that clocks out. Since Knights N Squires is part monster collection, the player has to deal with varying rarities for either optimizing their party or just for collection’s sake. Your character and your allies level up as you progress and you can upgrade them by the usual sacrificial fusion of other less desirable allies as materials. The game has lots of items to use and sell. Swords have elemental attributes, shields and armors can increase HP, reduce cool-down times for skills, and do others things we know and love, RPG style. Unlike the many games and apps out there where the RPG elements feel unnecessary, gearing up is essential in this game. If you don’t upgrade your allies, or level them up, or sometimes even bringing the right ones for the job, then you aren’t going to get far. Aesthetically speaking, the character arts are simple no-shade cutesy chibi vectors, which puts a little bit of dark humor to it, as you are finding massive feats of running carnage adorable. Looking at it for the first time may make you think it’s a little too simplistic, but it works when there are a lot of things going on in the screen. It also makes collecting the many different units worthwhile, as though most of them don’t really perform anything that sets them considerably apart from the others (and you’re better off just searching for high starred units for efficiency), each unit has seemingly its own character that you just can’t help but put a little bit more effort into collecting them. There’s a stamina system that’s ever-present in most mobile apps. There’s no escaping the free-mium mechanics that comes with free-to-play games, I guess. The good thing about it here though is that there is no invasive aggression for players to make in-game purchases, which include upgrading item slots, buying new main characters, and easing up on the energy system. Though, you are not required too, some of these purchases are quite tempting. Your default main character is purely just an attacking character. The other two alternate characters have better skills, one having a larger attack range and the other being able to guard even while throwing her shield. As grinding is necessary and levels get progressively more difficult, either of these two alternate characters can make life easier and is apparently essential to reach the top rankings. I’m completely fine with the basic character since just focusing harder on your tactics and reflexes will still get you by, which is nice, but I would like to be able to guard while I take out the bajillion enemies hurdling at me from both ground and sky. My only other real complaint would be that it disconnects a lot. It’s not even an internet problem. Sometimes you just load a different screen then it goes kaput. I really hope they fix that as it’s the only real thing ruining the experience. 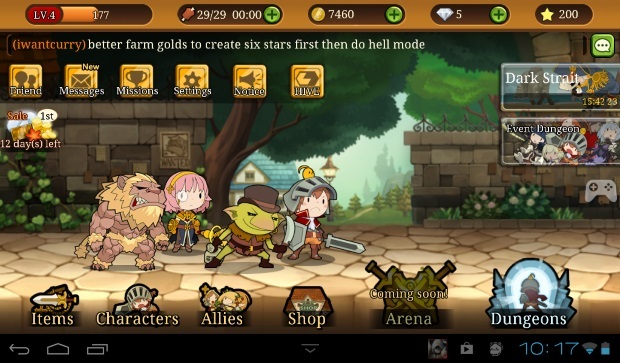 All in all, Knights N Squires is worth the download. 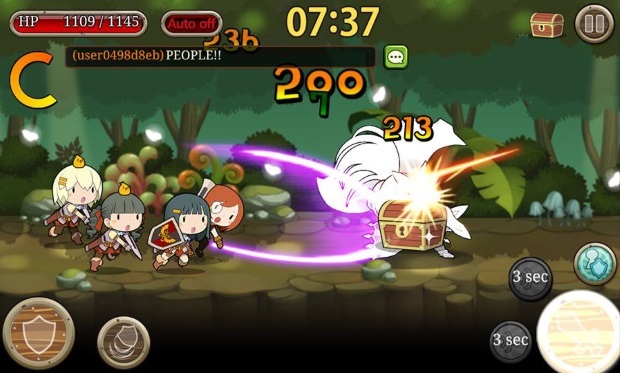 It’s a great, complex action game with a cute look and high speed gameplay. Shelling out some cash for some much needed upgrades isn’t too bad, but it does cheapen the experience a bit. Otherwise, running out of in-game stamina is the only reason that makes me put the game down.